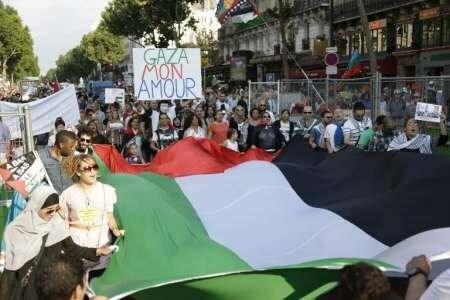 A rally was staged by CODEPINK and Jewish Voice for Peace organizations in protest at Israel’s violation of Palestinians’ rights and aggression on Gaza. The rally-goers protested outside of the Christians United for Israel (CUFI) National Summit. For far too long, CUFI had influenced American foreign policy to support Israel’s extreme violations of Palestinian human rights. 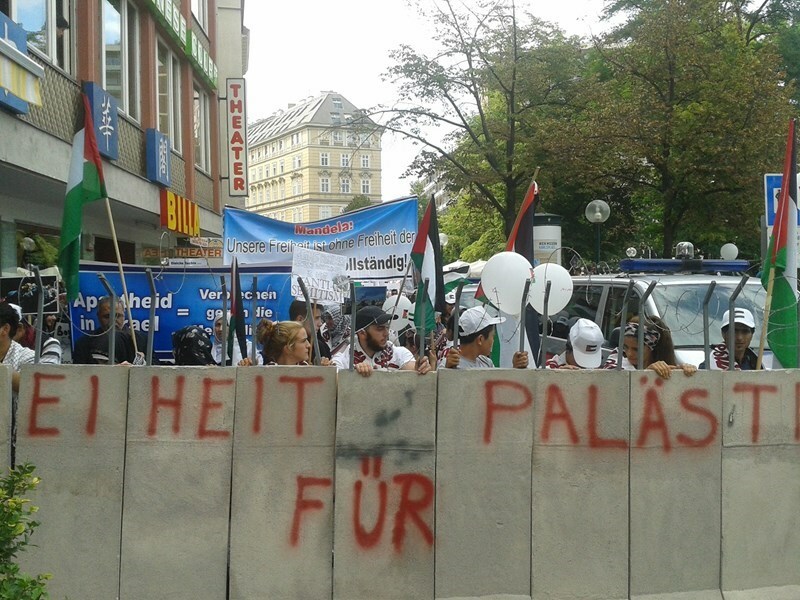 The demonstrators paid tribute to the souls of the Palestinian civilians who were murdered in last summer’s Israeli offensive on the blockaded Gaza Strip. Spokesperson for the rally slammed the Israeli occupation for committing horrendous crimes against the Palestinian people, particularly, but not exclusively, in besieged Gaza. Tomorrow, FIFA will come to a decision on whether they will suspend Israel's football association after the Palestinian Football Federation filed a complaint on Israeli abuse towards Palestinian footballers. 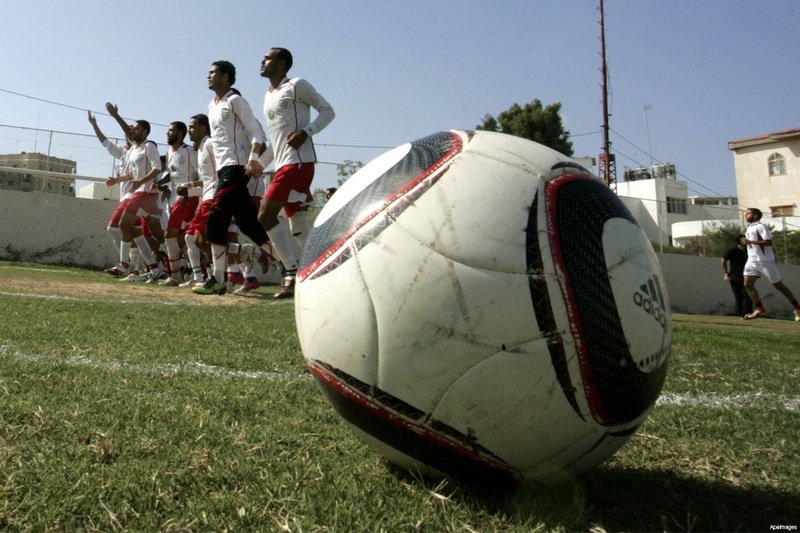 For years, Palestinian footballers have been subject to physical harassment, including beatings, detentions and chanting racist abuse in football matches. Independent Jewish Voices (IJV) has joined Palestinians and Israeli peace groups to support the suspension of Israel's football association. They reiterated the need to bring justice to the many Palestinian players that have had their passion for football demonised by the fascist sentiments in Israeli football, along with their previous activism in regards to the issue. The head of FIFA, Sepp Blatter met an IJV activist, Jeff Halper who briefed Blatter on some of the abuses Palestinians have received which include Palestinian players being detained by the Israeli government on the way to matches and denying entry to players from Gaza meeting their colleagues in the West Bank. Israeli fans have also been taking part in this abuse, with shooting two teenage Palestinian players in the leg and even a whole team, Beitar Jerusalem that denies any Palestinian players, while their fans ritually abuse Palestinian players on other teams chant "death to Arabs" in matches. The Israeli Football Association has refused to take even the smallest steps to curb racism in Israeli football. The most egregious behaviour is by the team Beitar Jerusalem, which has an open policy of not hiring Arab or Muslim players, even from abroad. Its fans are sadistic and insulting to Palestinian players on other teams and regularly chant "Death to Arabs" after Beitar goals. 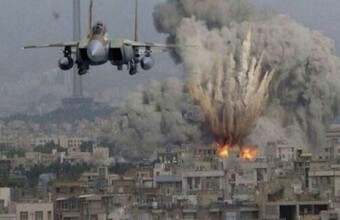 Three team members were killed in the 2012 Operation Cast Lead and the team's soccer stadium in Rafah, Gaza and the federation's headquarters were bombed during that incursion. A teenaged Palestinian soccer star, Mohammed al-Qatari received an IDF bullet straight to the chest while protesting Israel's last war in Gaza. Hundreds of rabbis from the four corners of the world have slammed Israeli Prime Minister Benjamin Netanyahu for acting against the international law. Rabbis for Human Rights (RHR) submitted an open letter by as many as 400 rabbis from across the world to the Israeli premier, criticizing his policies toward Palestinians. “Thousands have been forced to build without permits, and great human suffering is caused when hundreds of homes are demolished each year,” the letter stated. It was in reaction to Netanyahu’s recent decision to destroy some 400 newly-built Palestinian homes in the occupied West Bank. The move by the Israeli premier came after the British newspaper Daily Mail in a report alleged that the European Union had funded the construction of the homes, according to Israeli media. Tel Aviv claims that the EU should have asked for its permit for the construction. On February 6, a spokesman for the EU, whose name was not mentioned in the reports, defended its funding for the Palestinian homes. “Palestinians have a right to live there, build schools there, have economic development,” Othman added. On January 23, James W. Rawley, the UN resident and humanitarian coordinator, voiced concern over Israel’s recent spate of demolitions in the West Bank and East al-Quds. “Some of the demolished structures were provided by the international community to support vulnerable families. 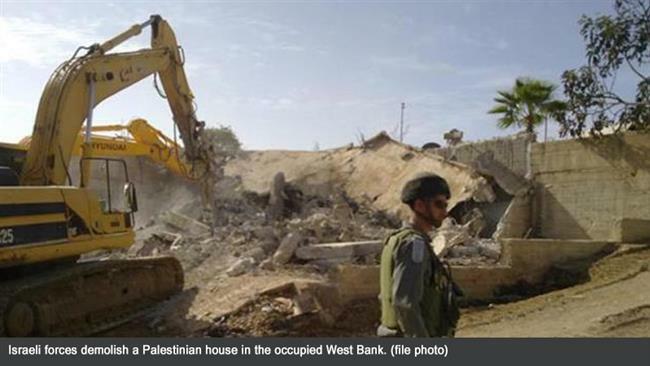 Demolitions that result in forced evictions and displacement run counter to Israel’s obligations under international law,” Rawley added. The developments come amid widespread global condemnation of Israel’s land grab policies. Tel Aviv has approved a series of plans for new settler units in East al-Quds in recent months. The European Union has often criticized Israel for building thousands of settlement units in the occupied Palestinian territories. Upward of half a million Israelis live in more than 120 settlements built since Israel’s occupation of the Palestinian territories of the West Bank, including East al-Quds, in 1967. The Israeli settlements are considered to be illegal by much of the international community because the territories were captured by Israel in a war in 1967 and are thus subject to the Geneva Conventions, which forbid construction on occupied lands. 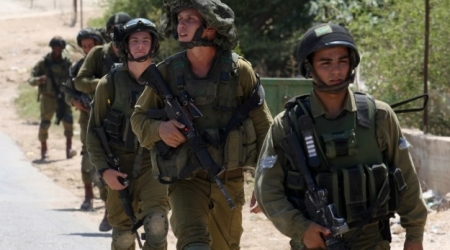 The Israeli military has dismissed 43 soldiers for publicly criticizing the Tel Aviv regime’s crimes against Palestinians. In a letter published by Israeli media in September of 2014, the soldiers wrote to Prime Minister Benjamin Netanyahu and top army chiefs that they could no longer serve in the unit because they did not want to participate in the injustices committed against Palestinians. The signatories also criticized the “political persecution” which their spying activities involved. The letter was reportedly written a few weeks after Israel’s devastating military offensive on the Gaza Strip, this past summer. A protest this week in New York City was accompanied by the submission of a petition to the New York City Council demanding that the Council cancel an upcoming all-expense-paid hasbara trip to Israel, funded by the deep-pocketed political advocacy groups 'Jewish Community Relations Council' and 'United Jewish Appeal'. The City Council of New York is considered one of the most progressive in the country, having publicly taken a stand against the targeting of mosques by law enforcement throughout the city, and urging tolerance instead of Islamophobia. 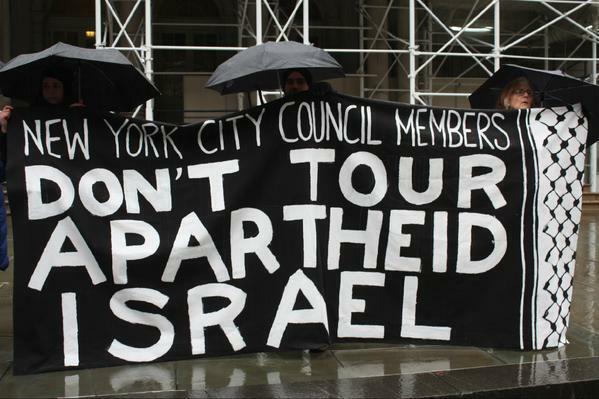 But over a dozen members of the City Council have accepted all-expense-paid trips to Israel beginning February 15th, sponsored by Zionist organizations, whose stated purpose is to bring international visitors, particularly US politicians, to Israel in order to "see things from an Israeli perspective". These trips are considered 'hasbara', which is the Hebrew for public relations, and is often referred to by anti-apartheid activists as a type of Zionist propaganda that whitewashes and downplays the Israeli occupation and takeover of Palestinian land. Representatives of the forty community groups that signed on to the petition gathered in the freezing cold outside New York's City Council to deliver their message this week. The protest was led by Jewish Voice for Peace, and included representatives from the Committee Against Anti-Asian Violence, the Malcolm X Grassroots Movement, the Direct Action Front for Palestine, and Jews Against Islamophobia. The City Council members who have been identified as accepting the free hasbara trips to Israel are Council Speaker Melissa Mark-Viverito, Mark Treyger, Brad Lander, Antonio Reynoso, David Greenfield, Rafael Espinal, Darlene Mealy, Mark Levine, Helen Rosenthal, Corey Johnson, Ritchie Torres, Andrew Cohen, Donovan Richards, Eric Ulrich, and James Van Bramer. Almost a year ago, in February 2014, the Mondoweiss blog exposed the JCRC as being behind anti-boycott legislation in the New York and other state legislatures, as well as leading the opposition to a boycott of Israeli goods by a coop grocery store in Brooklyn. The legislation in question has targeted academic organizations, like the American Studies Association, who have taken a stand in support of the Boycott-Divestment-Sanctions movement. The legislation has been passed in several states, and it strips the organizations of their funding and status. 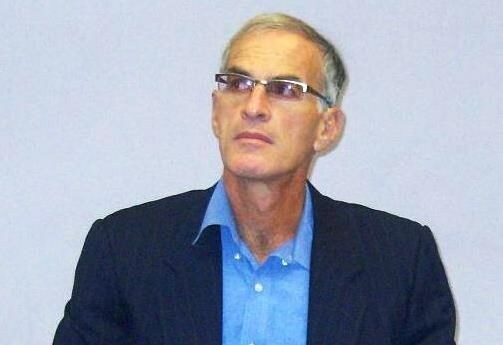 The Boycott-Divestment-Sanctions movement is an international movement aimed at pressuring Israel economically to end its occupation of Palestinian land, and allow for equal rights for all people living in the land of historic Palestine, as well as calling on Israel to adhere to international law and signed treaties and conventions. David Galarza, a Puerto Rican activist, spome at the rally in the freezing rain, and, according to Mondoweiss, "likened the four boys killed on the beach in Gaza during Operation Protective Edge to the four girls who died in the bombing of a black church in Birmingham, Alabama; where, he wondered, was Charlie Hebdo-style solidarity in the case of the murdered Baker children? 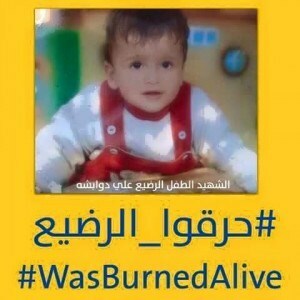 Photographs of the two bombings [Gaza beach and Birmingham church] were held up as Galarza declared his identification with the eight victims, alternating Palestinian and African-American names."